Ranveer Singh Has A Fave Kind Of Dosa & It's All Because Of His Love For Deepika Padukone! After Chicken Sanju Baba, Sunny Leone Chaap and Kareena Kapoor Size Zero Pizza, now Deepika Padukone has a dosa by her name. The actress, who seems to be as amused as us by this weird discovery, shared a fan's post about the dosa and tweeted "What a great way to begin the year... Happy New Year." Soon after, another fan shared a picture of a menu from an eatery in Pune and wrote: "You are also a parantha thali in Pune." Hubby Ranveer Singh who seems to be enjoying the joke also shared the picture on his Insta stories and captioned it, "I will eat this." The dosa is a speciality at an Indian restaurant called Dosa Labs in Texas. It comes with a potato mix and has fiery red chillis on top of it. Though there are a lot of other quirky dishes on the menu like Airy Fairy Keema and Mast mast Cheez, this particular dosa is the only one dedicated to a Bollywood celebrity! We are sure all Deepika fans would like to taste this delicacy at least once! The couple tied the knot in November last year in a much-hyped ceremony at Italy's Lake Como. 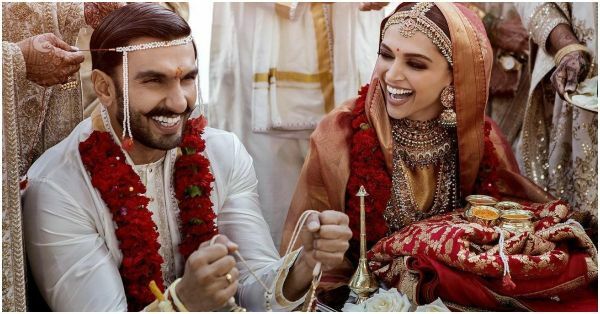 The couple then hosted three lavish wedding receptions in Mumbai and Bengaluru. Ranveer and Deepika were recently spotted at the Mumbai airport twinning in black outfits, headed for New Year's celebrations. Deepika will soon start shooting for Meghna Gulzar's Chhapaak in March. Meanwhile, Ranveer, who was occupied with the promotions of his film Simmba (that has already made 124 crores at the box office) has been sharing posters from his next movie Gully Boy. The film is set to hit the screens on February 14.